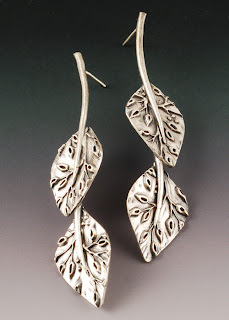 I totally love the new sterling clay! 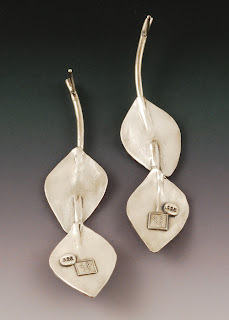 The idea that I can embed sterling posts for earrings or pearls or other attachments is just so appealing. 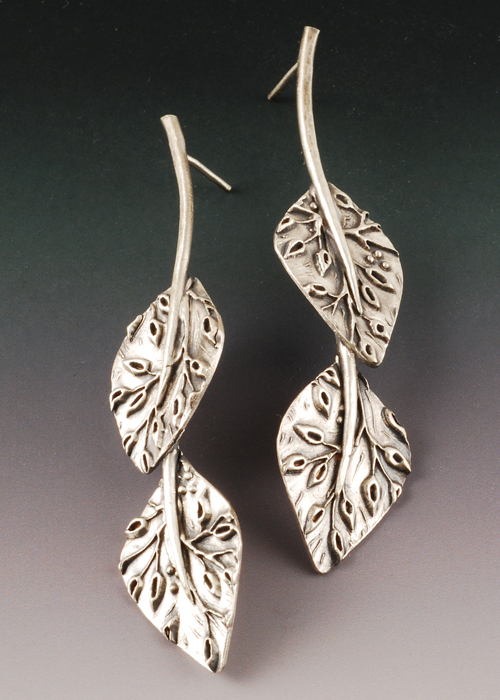 These are the latest sterling earrings in my collection, with double leaf-textured leaves, coil/snake stems and embedded sterling wire posts. 2 1/2" long. Strong, sturdy, work-hardened! With the glow of sterling that is so much warmer than fine silver. Do you still fire at 1500? I know the soldius melting point is lower, but the liquid one is higher? Do you think argentium would work? Yes, I did still fire at 1500. I have not yet embedded Argentium wire. I see different numbers on the solidus & liquidus from different sources, so I'm not clear if the range is really larger or not. Not really relevant for us, since we don't want to get to the point of being completely melted. In general, it seems that Argentium might need the temperature reduced a bit, perhaps 40F or so. WIll the sterling clay still sinter at the lower temp? I suspect so, but only tests will tell. No, I don't think it is brittle. I think I just didn't hold the stem/post while I twisted it, like I was supposed to, so all the torque went into the joint instead of distributing along the entire wire. It broke in the wire part, not the metal clay part. On these, I put on enough force while rounding off one post end to bend the already hardened wire over at a right angle. It straightened back out without issue and then I twisted it some more to get it stronger. No breaking. I've been wearing the first pair of earrings daily for weeks now...no issues. Happy to help! ;-) The admiration is mutual.